Keith grew up a typical military dependent making multiple moves until his father retired from the Air Force and moved the family to Omaha, Nebraska. Following high school, Keith entered the Air Force and spent 20 years active duty as an Air Traffic Controller retiring as a Master Sergeant in 1999. His duty stations included Offutt AFB NE, Presidio of Monterey CA, Zaragoza AB Spain, Altus AFB OK, Tonopah Test Range NV, Palmerola AB Honduras, King Khalid AB Saudi Arabia (Desert Storm), Panama City Panama, Bogota Colombia, Quito Ecuador, and lastly Whiteman AFB MO. 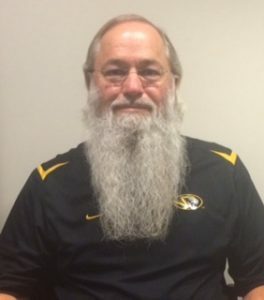 After retiring from the military Keith chose to make Missouri his home and went to work for the University of Missouri. Keith has been with the University since 1999. Keith and his wife Lynn Herdzina who was also the dependent of an Air Force retired father, have been married 36 years in 2015. He has two sons and three grandsons.